Instant Pot Egg Rolls in a bowl, a recipe my boys absolutely love and I think you will too! There are Paleo options in the post for those of you that need it. 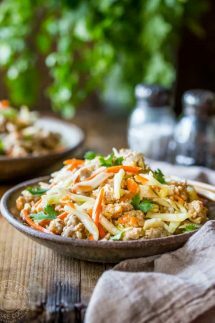 My Instant Pot Egg Rolls in a bowl are made with pork, shredded vegetables, garlic, ginger and a tasty sauce that will leave you wanting more! 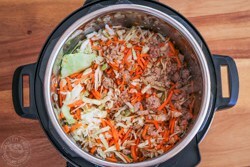 Here are a few quick step by step guidelines for makingInstant Pot egg rolls in a bowl, the full recipe is at the end of the post. 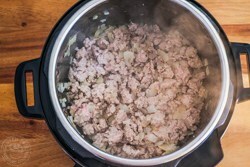 Step 2 – Saute the pork and onions in your Instant Pot for a couple of minutes. Step 4 – Turn on the sauté function. Add the vegetables, garlic, ginger, and sauce and stir well. 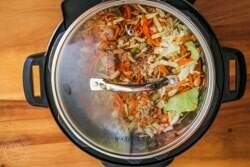 Step 5 – then put the lid on and let the vegetables cook down for just a couple of minutes. I like my vegetables with a bit of crunch so it only takes about two minutes, cook for longer if you want them softer. 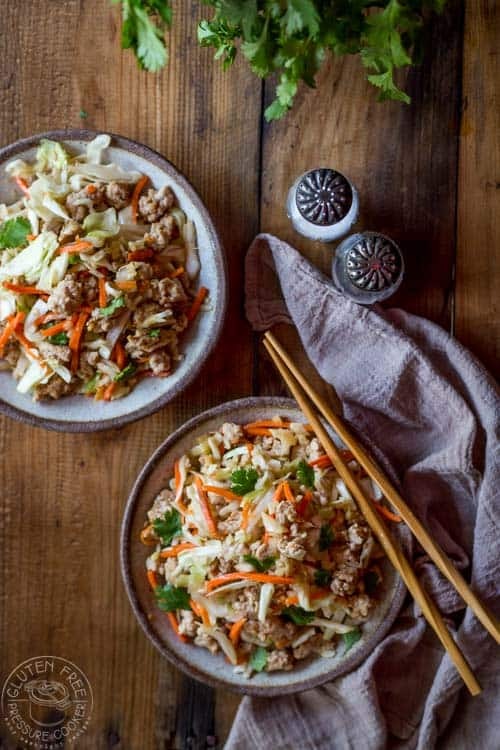 Can I make Paleo Instant Pot Egg Rolls in a Bowl? 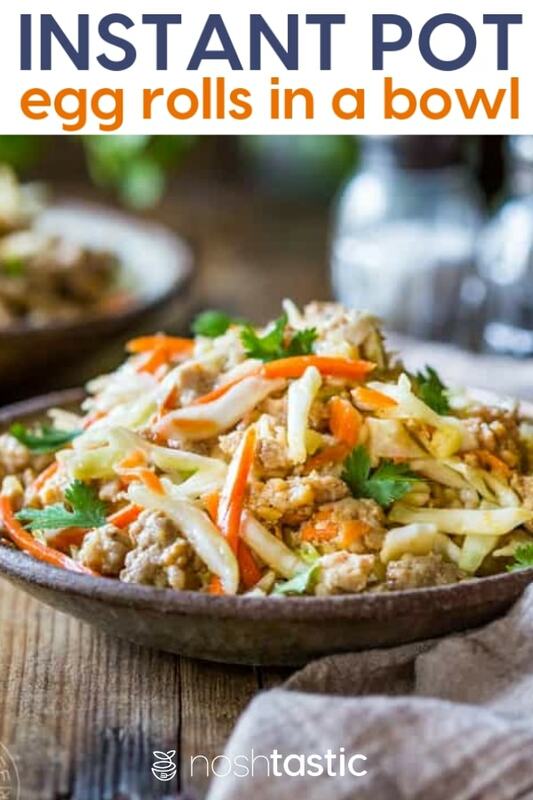 Yes, you absolutely can make Paleo <Instant Pot Egg Rolls in a bowl, it’s really easy and just requires a couple of simple substitutions. So first, you need to replace the gluten free Soy Sauce with Coconut Aminos. They have a very similar taste but are not quite as strong so you may need to add a little more to the finished recipe, just taste and see how you like it. I know some people are ok cooking with alcohol on a Paleo diet, and others are not so if you don’t want to use the Sherry , simply skip it. I don’t think there’s an adequate substitution for the flavor of the sherry. The second Paleo substitution is to use coconut sugar or a little honey in place of the brown sugar. Honey does tend to be sweeter than sugar so you may need to taste and see how the sauce is and start with a little less. Even if I’m not following Paleo I always, always, use Red Boat Fish Sauce, it has SUCH a superior taste to any of the other brands I’ve tried, and its Paleo and Whole30 compliant. 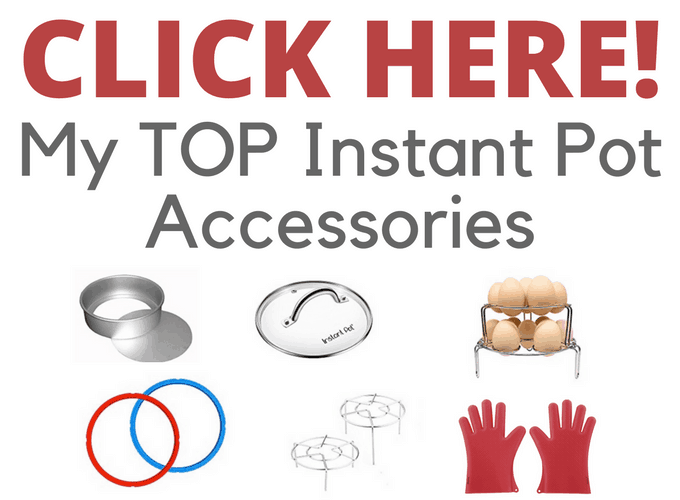 MORE GLUTEN FREE INSTANT POT RECIPES YOU’ll ENJOY! This is a classic recipe that’s been given a ‘do-over’ to make it work in the Instant Pot, I think you’ll love my pressure cooker Beef Bourguignon! 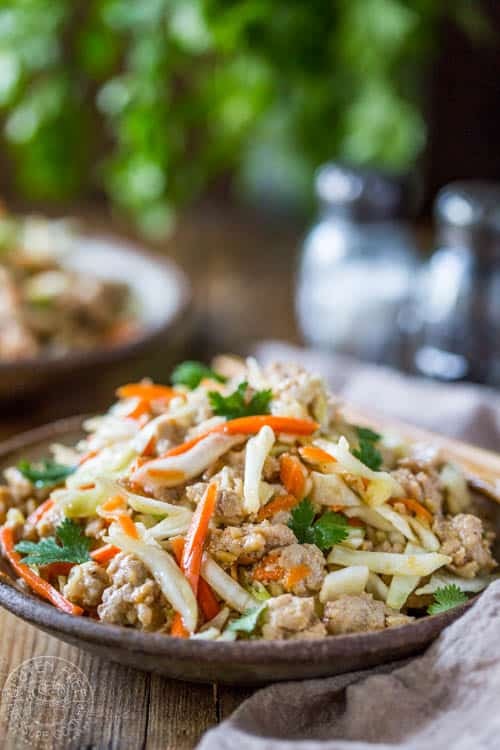 Healthy and delicious recipe for Instant pot Egg Rolls in a Bowl, made with ground pork, vegetables and simple seasoning, this quick recipe is a real treat that the whole family will love! You can make it Paleo too. Don't miss my short video for this recipe, you'll find it right below the directions. For Paleo substitutions please see the notes in the post. 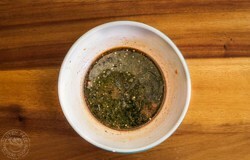 Make the sauce by adding all of the sauce ingredients into a small bowl and whisking well, then set aside. Brown the pork and onions in a little olive oil in the inner pot of the Instant Pot by turning on the saute function and adjust it to the medium heat setting. Don't wait for the display to say 'hot', add oil right away and cook the pork for two to three minutes, stirring all the time, then turn it off. Add the beef or chicken broth to the pot with the onions and pork. Lock the lid, turn the steam release vent to 'sealing' and using the manual setting, adjust it to cook for 4 minutes at High Pressure, then quick release. Add the garlic, ginger and the sauce to the pot, stir and turn back on the saute function. 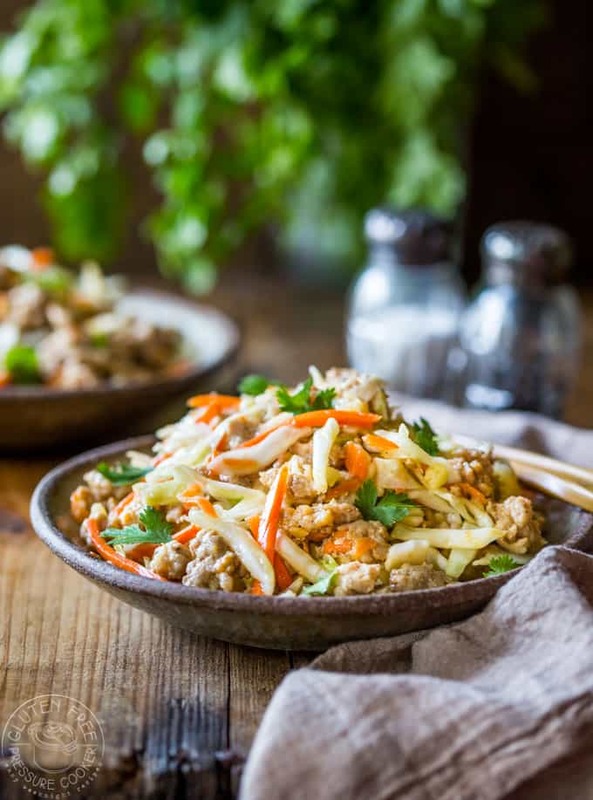 Add the shredded vegetables, garlic, ginger stir well and add the Instant Pot Glass lid and let the vegetables cook down for two or three minutes, longer if you want softer vegetables. PALEO OPTIONS - for full details on Paleo substitutions, please read the narrative in the post above where I cover all the substitutions you'll need. This is going in our rotation! Delish, and super easy. Can I double this recipe safely for a 6 quart IP? Looks great!!!! I have to try it. Fortunately I do have one of those pressure cookers. But didn’t have any good recipes to use it. Thanks to you. Now I do. That sure is a lot of salt when, at my age, I should limit my daily intake to 1,500mg max… I’ll work on tweeking it. It looks like it’s the soy sauce. Thanx for the jumping iff point! I make this at least once a week! It’s so good! One change I make is to use rice vinegar instead of sherry. I use mostly ground beef and also gluten free tamari. Yum! Sometimes I add sliced water chestnuts for crunch too. Great recipe! The water chestnuts sound like a fantastic idea Misty, I love it!! As much as I love my IP seems this would be easier cooked in a wok. Recipe sounds delicious. I’m going to try it with canned pork that I have. it is super easy to make this on the stove too but some folks just love to use their Instant Pot for ALL the things, so this recipe is for them as several readers had asked for an IP version of this recipe. This was P good. We’re adding it to our list of weeknight dinners. Next time I’ll try rice wine instead of Sherry to give it more kick, and serve it as a lettuce wraps. Thanks Mike! I’ve not been able to find rice wine without added wheat but if you’re not gluten free it’s a great option! This sounds really good. Would you recommend serving it over rice or ramen noodles? Hi Nancy, it will work well served with either, whatever you prefer! 🙂 Ramen might be easiest as it cooks super quick.